Do you spend a lot of money on Facebook Ads? According to marketers, many of them try diverse campaigns every day, hoping to find the most attractive and engaging ad design. To achieve this goal, they test a wide range of interests and target audiences, and even change the color of the advert text. But for many, the goal of finding that effective design remains beyond reach. They just cannot create a profitable ad that could attract the interest of people seeing it. As the result, they continue to invest and lose money to Facebook. This problem, however, can be solved relatively easily, and you can dramatically change the performance of your Facebook ads with the next design you produce. In fact, you can solve it today. For real! The trick is, well… There are actually eleven of them, and they are described in a cool infographic from Assignment Helper that we’ll use for this article. Some marketers make an unforgivable mistake by using one version of Facebook ad that they like. But what about the viewers? Do they like it? If they don’t, you’ll see that in the performance of the ad, and it would be a clear sign to move on. To know what ad works the best, you don’t need to assume and rely on your sense of design. Just develop a few options, test them, and determine the one that produces the best results. The buyer persona is the representation of your real customer that tells you what he or she is thinking and doing as they consider different options to address a problem that can be resolved by your business. This representation reveals insights into the decisions made by customers, thus allowing to align your marketing decisions with their expectations. This strategy perfectly applies to Facebook ads. When you have a clearly defined buyer persona, you can create a relevant design that can engage them. For example, your customer may have some specific questions about the product that he or she would ask to ensure that it will help to solve their problems. For example, the image below shows two ad designs that are looking to inspire confidence in the viewers. Simply explained, people want to know if the product is worth buying before they click on that “Add to Cart” button. If they don’t know that, they will fear losing the money, so they’re not going to buy that product. However, if you allow to try your product before buying, the customer will take your offer much more willingly. 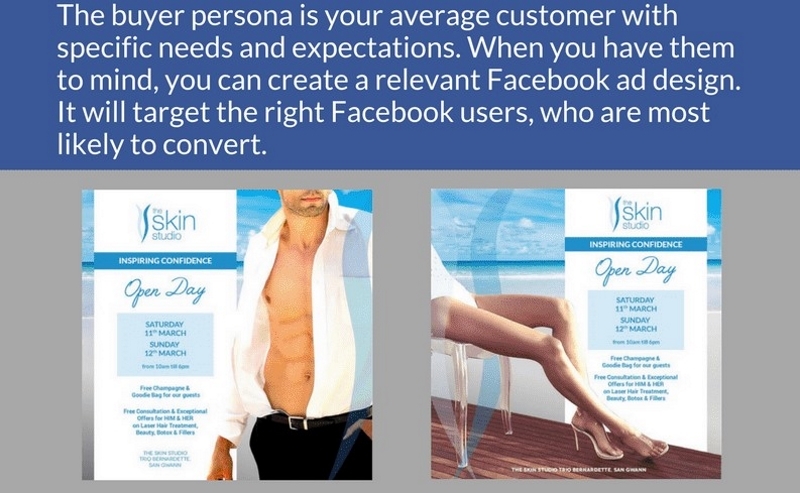 The two examples below show how it’s done using Facebook ads. Sometimes, the best method to encourage potential customers to take a desired action (to subscribe to a newsletter, order a product, try a service etc.) is to ask them directly in an appropriate way. On Facebook, it means that you need to include a clear call to action in your ad to show what you need the viewers to do. For example, the images below show how a business can encourage viewers to take action by using Sponsored posts with “Shop Now” and “Use Now” buttons. You can refer to this method as well in your marketing strategy. It is a known fact that posting images to Facebook is a good way to get more attention from fans because they are easier to consume than text. For example, posts with images typically see 2.3x more engagement than those without images, according to HubSpot. However, to really boost your connection with customers, it’s not enough to provide an image. You should select the right one. Lifestyle, galleries, or just beautiful photos – whatever you choose, it should be relevant to the post. This also applies if you want to insert a funny picture because if it’s not relevant, it may distract the viewer from taking that action you want them to take. Also, stay away from free photos, because many people are using them as well. If you want your business to be successful, you have to be unique. Psychology of color as it relates to persuasion is a big deal in marketing. Many companies attempted to classify consumer responses to different colors, and they defined some pretty interesting patterns. For example, blue is the preferred color of men which is associated with reliability, peace, and water. Red, on the other hand, encourages appetite (just think MacDonald’s) and creates a sense of urgency; therefore, it is good for clearance sales. Facebook advertising options allow to target customers in a specific area, which is great because you can set up a campaign with some local content. For example, you can use images of a city, neighborhood, or even a street to make the message more relevant and targeted. It is a good idea also to feature images of your stores in a specific area to inform the viewers about it. Take a look at example posts below. The one on the left, for instance, encourages people to come to a showroom in New York City to check out a product. It is a great example of a Facebook awareness campaign that may also create local interest in your brand as well. People love free stuff. By that, we don’t mean that you should go ahead and give away your product for free. A better idea is to provide potential customers with valuable and helpful information; for example, you can write blogs with useful content like tips. Or you can let your audience to try your product for free for a limited time, so they know how great it is. Let’s review a couple of examples. The one on the left offers viewers a free sample of a healthy snack without any commitment. The one on the right proposes to check out a free step-by-step guide to creating Facebook ads, which is also helpful for many people. Here’s an interesting fact from another popular social network: Instagram photos that feature faces get 38 percent more likes than those without. That’s amazing, and the studies have shown that we are drawn to human faces in imagery. For example, Canva described that people are hardwired to respond to faces because the brain has a specific circuit for recognizing faces called the fusiform gyrus, or the fusiform face area. In other words, we respond to faces, so marketers use this to attract attention to their content. For example, the posts below demonstrate how this can be applied in practice. People today heavily rely on recommendations from their friends, family, and even strangers. For example, The Local Consumer Review Survey 2017 reported that 85 percent of consumers trusted online reviews as much as personal recommendations; also, positive reviews made more than 70 percent of them trust a business more. So people are looking for some social proof to make their choice of a company to do some business with. You should give them that. It’s not difficult at all: just ask some of your customers to share their thoughts on working with you and include these testimonials in Facebook ads. As a result, the person clicking on that ad will be more confident in your reliability. Urgency psychology is another popular source of great marketing knowledge. Scientific studies have described that urgent situations cause people to suspend deliberate thought and act very quickly. So, many marketers now are doing their best to create a strong sense of urgency in ads. How does one create it? Well, there are a number of ways that you can use for Facebook ads. First, you can use scarcity; according to this principle, your message should tell the viewers that the number of items of a certain product is quickly decreasing, so they must act now to get one. So, how about giving these techniques a shot? They’ve worked for many marketers, so they can be a huge help for you as well. Thanks again to the creators of 11 Tricks to Create Great Facebook Ad Designs infographic for amazing tips on improving the effectiveness of Facebook marketing. So, it’s over to you now. Feel free to try some of these techniques and produce some amazing results! Excellent strategy Lucy, I’ve been playing around with Facebook ads a little but nothing intense thus far. I have however managed to leverage my Facebook Pages and gain subscribers to my Email List, by adding a Subscribe Button. The Call To Action really works well, glad you mention that. As someone who has done facebook ads in the past i think this is one of the best posts i’ve seen about facebook ads to date! Really well written and extremely informative. Will be sure to implement some of these strategies in my own startup! Thanks so much!